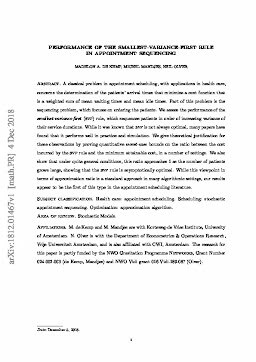 A classical problem in appointment scheduling, with applications in health care, concerns the determination of the patients' arrival times that minimize a cost function that is a weighted sum of mean waiting times and mean idle times. Part of this problem is the sequencing problem, which focuses on ordering the patients. We assess the performance of the smallest-variance-first (SVF) rule, which sequences patients in order of increasing variance of their service durations. While it was known that SVF is not always optimal, many papers have found that it performs well in practice and simulation. We give theoretical justification for these observations by proving quantitative worst-case bounds on the ratio between the cost incurred by the SVF rule and the minimum attainable cost, in a number of settings. We also show that under quite general conditions, this ratio approaches 1 as the number of patients grows large, showing that the SVF rule is asymptotically optimal. While this viewpoint in terms of approximation ratio is a standard approach in many algorithmic settings, our results appear to be the first of this type in the appointment scheduling literature. de Kemp, M.A, Mandjes, M.R.H, & Olver, N.K. (2018). Performance of the smallest-variance-first rule in appointment sequencing.